For the past 2 weeks I have been working on this bunga songket flower for cocktail table centerpiece. An event management person contacted me and asking whether I could make bunga songket arrangement for the proposed event. Since I have never made floral arrangement with custom made bunga songket before, I was interested to try my hand on that. The only songket I have in stock is this red one which I bought intentionally for my son’s majlis akikah and cukur jambul (which we haven’t had the chance to do). I have learned a lot from making this centerpiece arrangement. Even though in the end I didn’t get the order for the event, at least now I know something new about floral arrangement. Next thing I want to try making hand bouquet using bunga songket. 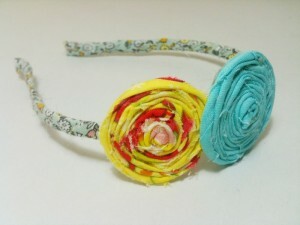 Remember my previous few posts about these fabric rosettes which look more like lollipop? 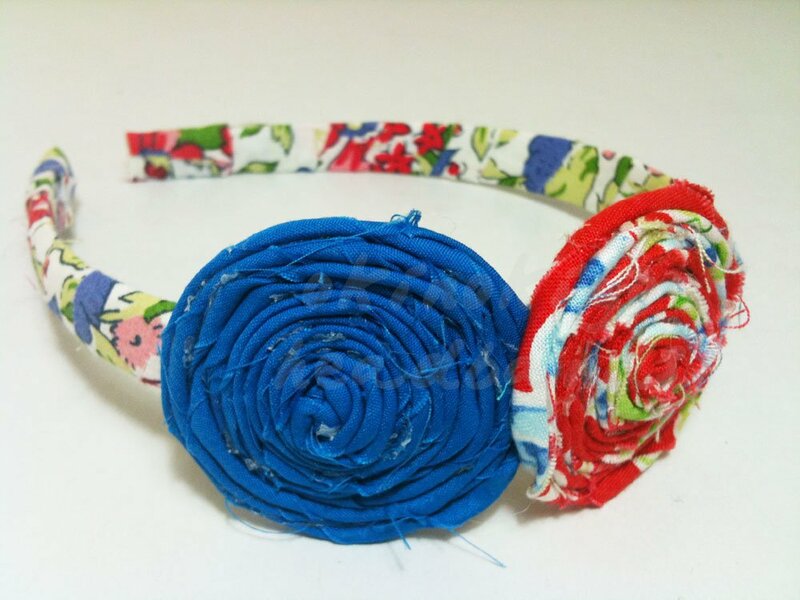 My friend Mai of Okinokiyo Shop has managed to use the fabric lollipop as embellishment on fabric wrapped headbands. 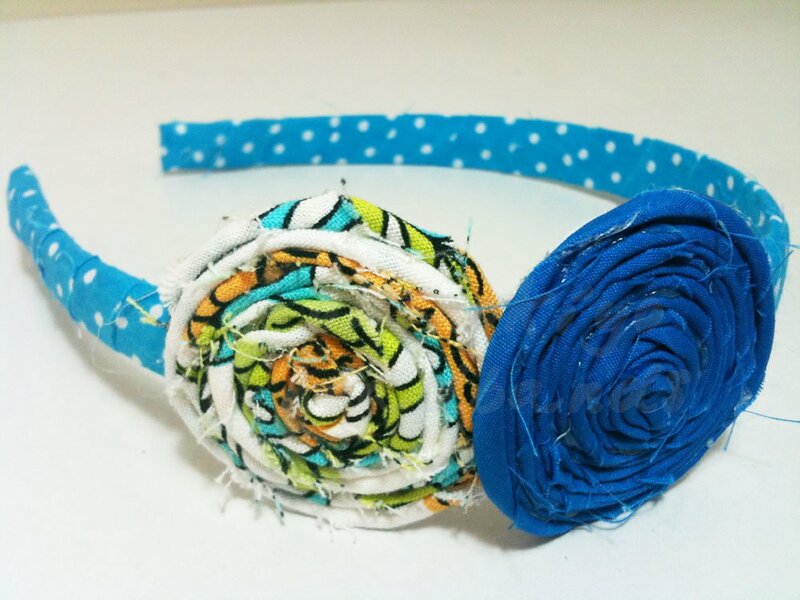 This is how each unique headband looks like. Luckily she has a lot of fabrics that could be matched with the rosettes I made because when I made them, I have no idea what the end product will be like. 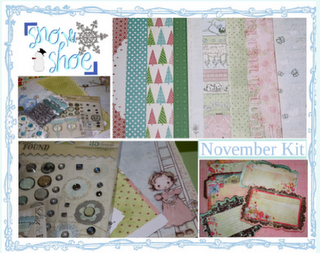 I just notice that I didn’t make more in green varieties. Well, I just bought more fabrics last weekend and I have made sure there’s green based cotton (both plain and printed) among the stack. My personal favorite is this yellow and black combination. Unfortunately I have no daughter and my two grand nieces are still too young to enjoy being pretty..huhu! For those who would like to have this one of a kind headband for Hari Raya, kindly visit the Okinokiyo Shop on Facebook. I’m not sure whether she has advertised this on their official blog. Oh, for those who are brave and stylish enough, you can even wear this headband on top of your hijab/tudung..especially if you are wearing those shawl like Hana Tajima or Yuna..just some idea to style up your clothing. 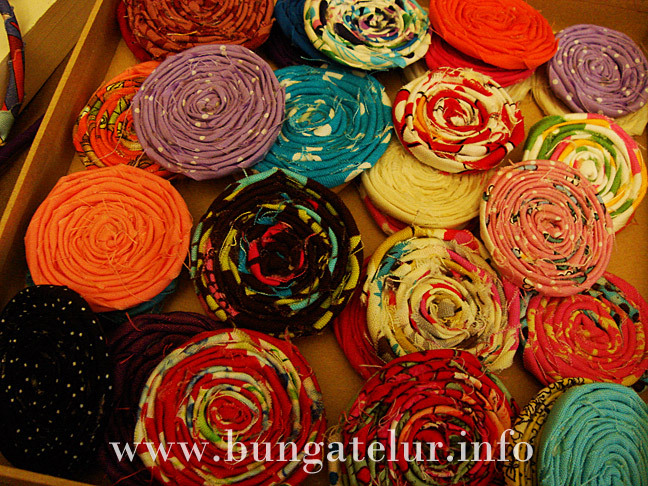 I have been working on these colorful fabric rosettes diligently last week to the extend of falling sick..huhu! Actually I have not been feeling very well the week before but I thought I won’t succumb to the flu and fever season as many have fell into. 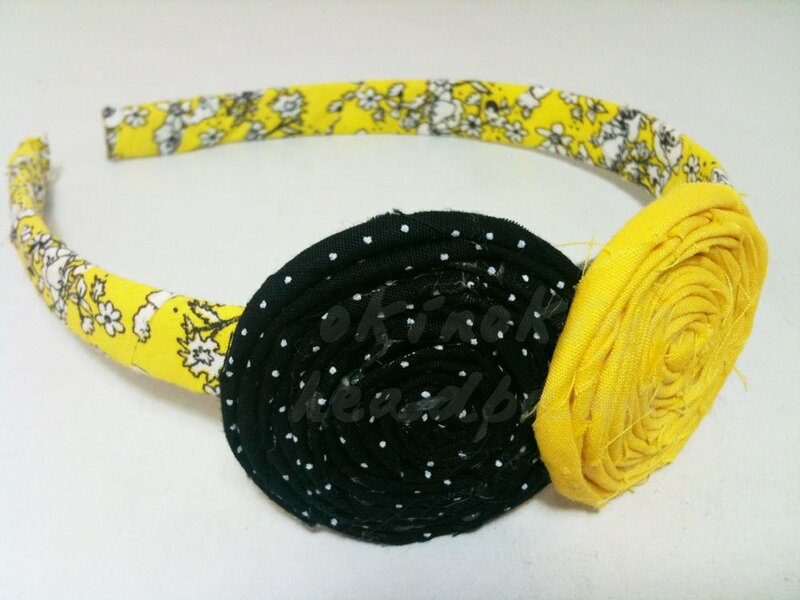 Anyway, the fabric rosettes which look more like a lollipop were actually made for Okinokiyo.com. She used them to embellish the headbands and fabric yoyo brooch for Urbanscape 2011 held yesterday. I was not able to go to Urbanscape this year as I have craft class in the afternoon and as usual I won’t be having enough sleep the night before due to anxiety of oversleeping thus lack of energy to continue doing anything else after the class has finished. Well, maybe next year I could go and see in person what’s the city’s all-day creative arts festival is all about. 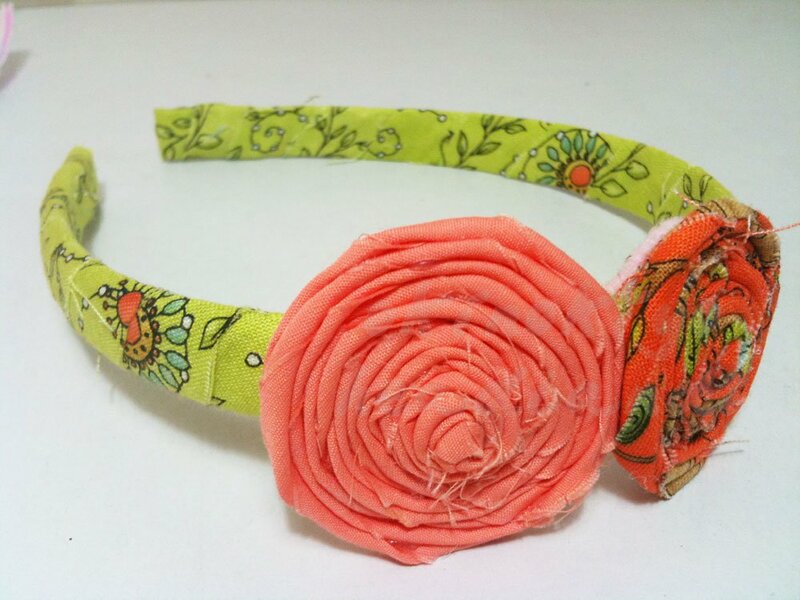 Coming back to the subject of these fabric rosettes, I am planning to make them into hair clip. From previous year’s post Hari Raya feedback, most of my friends with daughters told me that their kids prefer to wear hair clip than crocheted headband. OK, friends’ daughters..let see how many fabric rosette hair clips this Aunty could make to be given away during the coming Hari Raya open house..haha!